Wonder Buffalo, the third R&D film short to explore, test and prove next generation production processes and technologies under the auspices of the USC Entertainment Technology Center (ETC)’s Project Cloud and the first under the USC World Building Media Lab (WbML)’s Project Tesseract, is a live-action coming of age story about a first-generation Thai-American teen who loses herself in her own imagination. The production of Wonder Buffalo was made possible through ETC’s 2016 Innovative Technology Award granted to filmmaker Christine Berg and writing partner Simon Shterenberg. The script was developed by the duo at the Writers Guild Foundation’s Veterans Writing Program, which pairs military veterans with WGA film and television writers. Not only utilizing next-generation cloud production and postproduction technologies, the film was processed entirely in HDR through post production to accomplish a true “glass-to-glass” HDR production, blazing new trails in cinematic storytelling extended through immersive media and bringing together for the first time volumetric capture, photogrammetry, ambisonic sound and interactivity. The live-action short film was made simultaneously with an interactive, room-scale VR/AR companion piece that reinforces its strong social message of empowerment through positive body image and personal creativity. This co-development was made possible through the use of the WbML’s worldbuilding methodology, overseen by worldbuilder Brandon Cahoon with WbML director Alex McDowell and WbML creative director Geoffrey Long. The worldbuilding process deepened Berg and Shterenberg’s understanding of the story they sought to tell, identifying core themes and symbols that would resonate through both the film and VR experiences early in pre-production. This enabled the two experiences to be much more cohesive, and their co-production to be much more efficient. Wonder Buffalo bridges storytelling through film, alternate reality, virtual reality, and innovative technology platforms for creatives, including the Cinema Content Creation Cloud (C4), an open-source framework for content creation using remote resources. 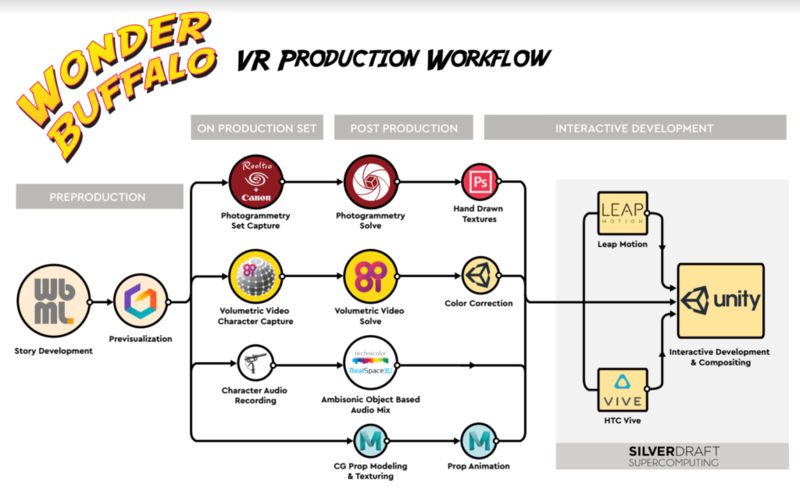 Wonder Buffalo was developed with the support of Disney/ABC Television Group, Warner Bros., NAGRA Kudelski Group, Technicolor, 8i, Realtra, Equinix, Sony Electronics, Amazon Web Services, the Creative Visions Foundation, and the USC School of Cinematic Arts. Wonder Buffalo made its debut at Sundance, with its official premiere at SXSW.